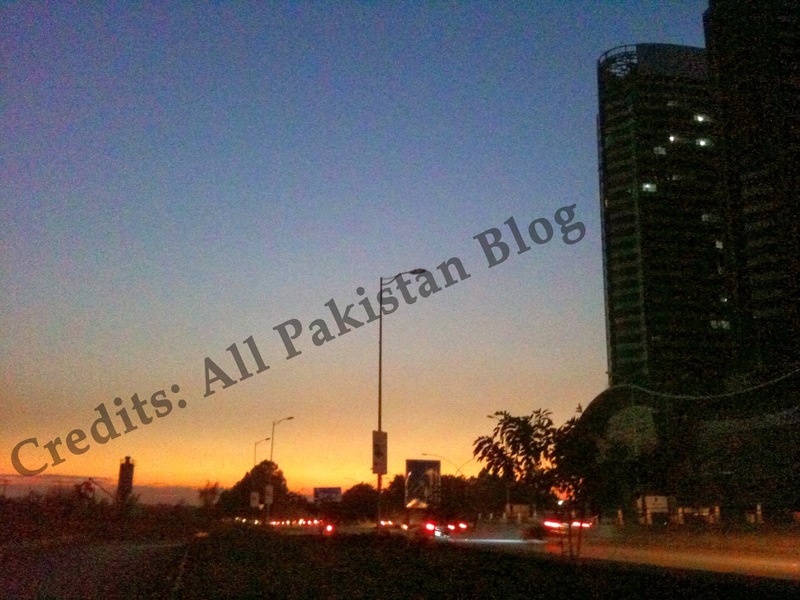 Blog about what is happening in Pakistan and around. March, 29th: Today millions of people around the globe will participate in Earth Hour by switching off lights in offices, homes and other landmarks at 8:30 pm local times for an hour. 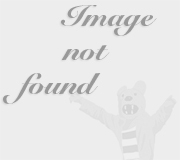 Earth Hour is an initiative by WWF which started in 2007 at Sydney, Australia as a light-off event. This event aims to unite people around the globe to protect the planet. In first Earth Hour, more than 2.2 million individuals and 2,000 businesses turned off their lights for an hour. In Pakistan, Earth Hour is observed in all major cities. 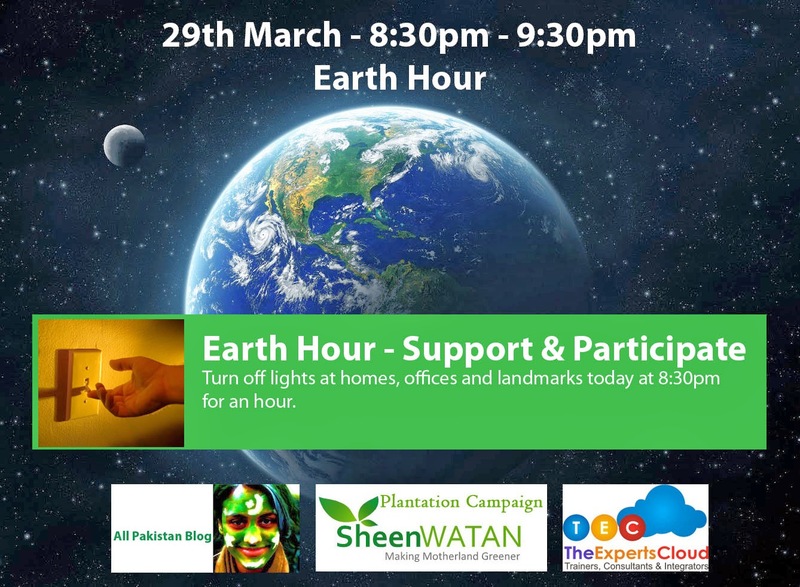 Members and volunteers of SheenWatan, an environmental and plantation advocacy campaign in Peshawar, have pledged to participate and support Earth Hour. In a statement, Mr. Khan, Manager CSR, TheExpertsCloud said; "We have to give back to environment and mother nature. This is our responsibility and we must not ignore it. If we want to see our children living in a healthy environment, we must act today. 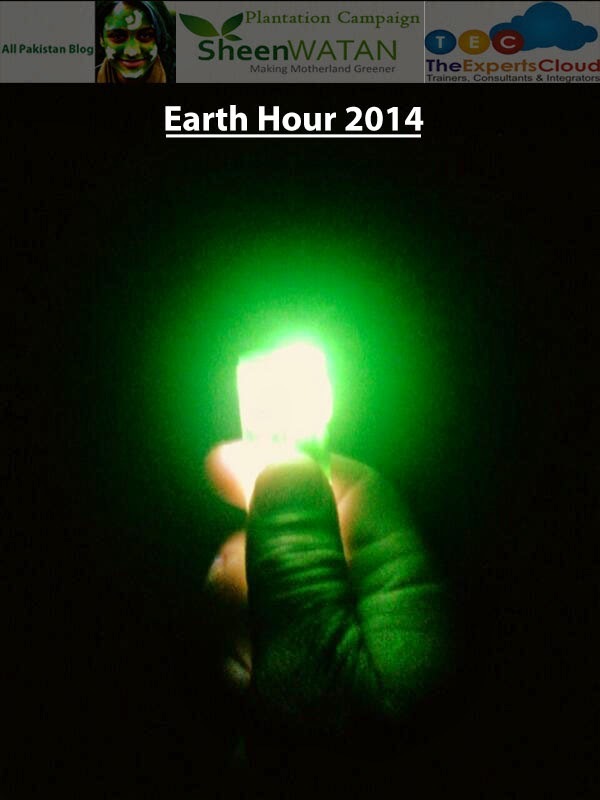 TheExpertsCloud will be observing Earth Hour today and would request your readers to participate too. We must not ignore the issue." TheExpertsCloud is a partner of SheenWatan and is currently leading the plantation campaign in KPK. Raza Rumi survives gun attack. Renowned columnist and anchorperson Raza Rumi was injured today in an attack by unknown gunmen in Lahore. His guard and driver were also injured in the attack. The driver, Mustafa, later on succumbed to his injuries. The guard, Anwaar Hussain, is also said to be in critical condition. Rumi frequently spoke against the Taliban and was a critic of government policies for handling terrorism. Raza's driver has tragically succumbed to injury. Thank God that Raza is safe. 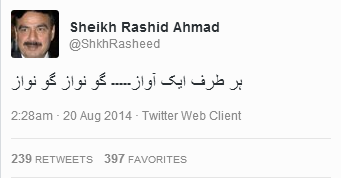 Many journos on TTP/LeJ hit list. Who will protect them? "@NadeemfParacha: Not a single word on most channels on the cowardly attack on @Razarumi." SHAME on these channels! Not a single word on most channels on the cowardly attack on @Razarumi. 12am news bulletin on Geo. 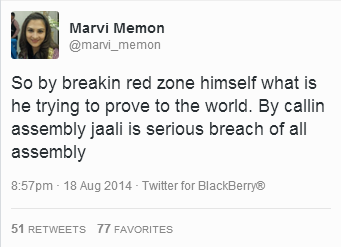 Still no mention of attack on @Razarumi. Ha! Why not just rename GeoNews, GeoNawaz? Shocked & saddened by attack on Raza Rumi & death of his driver. Govt must provide proper security & bring killers 2 justice. @Razarumi condemn attack on old lse colleague of mine! 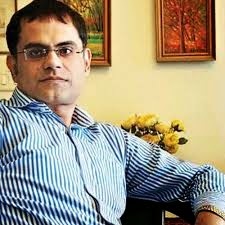 Horrified 2 hear abt attack on @Razarumi Impotent Condemnation frustratingly all I can do.attack is yet more proof appeasement doesn't work. 2013 - What is happening in Pakistan? 2013 started in Pakistan with dead bodies on the road, people protesting against their genocide, masses coming out to protest against the government, tension on LoC and more killings of people of Pakistan. Quetta bombings were the first of the series of mishaps, killing over 100 people. Most of them were from Shia Hazara community. Hazara community has lost over 1100 members in the past year in bomb blasts and target killings. Relatives of the dead put the dead bodies on the road in protest and demanded the dismissal of the government in Balochistan. They also demanded that security of Quetta city should be handed over to Paksitan Army as police and FC have failed to provide security to the residents of Quetta. Members of Hazara community were protesting with 83 dead bodies which they refused to bury until their demands are met. The govt. initially neglected the protest but when the civil society started protests all over Pakistan, Prime Minister Raja Pervaiz Ashraf announced Governor Rule in Balochistan. The dead were laid to rest after 4 days of protest. This protest was first of its kind in Pakistan where the relatives refused to bury their loved ones and continued to protest in the freezing weather until their demands were met. While this protest continued, Maulana Tahir ul Qadri, a Canadian national mullah, who had announced a Long March to over throw the government, took the center stage. Qadri claims that the government (PPP) and opposition party (PML-N) have joined hands to rig the upcoming election and that the election commission is ineffective and politicised. Qadri claimed that over 4 million people will gather at D-Chowk, Islamabad and will make it "Tahrir Square" of Pakistan. After traveling for over 36 hours, Qadri reached Islamabad where thousands of supporters were there to support him. His stage was initially set on Jinnah Ave, but he refused to accept it and asked his supporters to move the stage to D-Chowk which is in fornt of the Parliament in the Red Zone. During this police resisted and there was some aerial firing by the police as well. The stage for the protest is now set near D-Chowk and thousands of people are still staging a sit-in and waiting for orders from their leader. 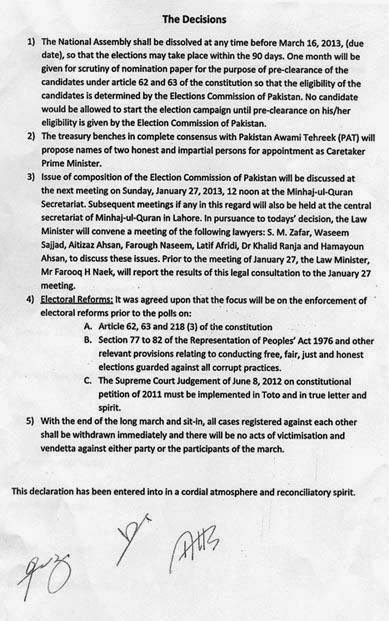 Mr. Qadri's demands include electoral reforms within the Law and Constitution, dissolution and reformation of Election Commission of Pakistan, dissolution of all assemblies and a fair caretaker government. Addressing from a bullet proof cabin, Qadri claims that they are ready to sacrifice lives for their cause. He has twice requested Chairman Pakistan Tehrik-e-Insaf, Imran Khan, to join him. 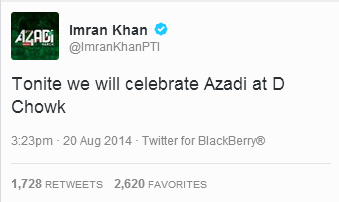 PTI refused to join the Long March and sit-in, even though they partially support TuQ agenda. 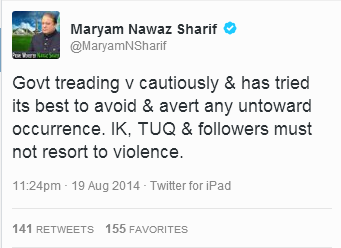 Till last reports, Qadri is still staging the protest and is determined to continue till his demands are met. In the mean while, Chief Justice Iftikhar Chaudhry ordered NAB to arrest all the accused in Rental Power Project including Prime Minister Raja Pervaiz Ashraf. Due to the timing of this decision, some speculated that there could be a relation between this order and TuQ's Long March. 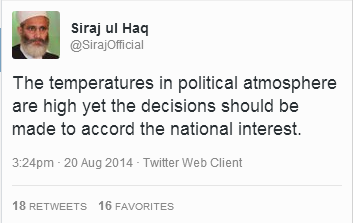 These speculations were later on dismissed by the CJ. Prime Minister is not arrested yet and it is believed that today Chairman NAB give reasons in Supreme Court of Pakistan for not taking action against the PM. In a twist of events, hundreds of protesters from Khyber Agency also staged a sit-in protest along with 13 dead bodies in front of Governor House, Peshawar. 18 bullet- riddled bodies of local people belonging to 3 different families were found in different areas of Bara Tehil. They accused the security forces of the killing and demanded that Bara operation must be stopped. KPK Governor, Masood Kausar while speaking to the media after a jirga with the tribesmen said that 7 lakh rupees each would be provided as compensation to the deceased's family and 4 lakh ruppes for burial of the deceased. Protesters however refused the compensation and demanded guarantees and assurances to conduct an inquiry of the killings. The protesters were later on dispersed by using teargas and aerial firing. One must not forget the tension on Line of Control with India where armed force personals have embraced martyrdom. A brigade level flag meeting was also held to defuse the tension. Both the countries are accusing each other of the violation of LoC. 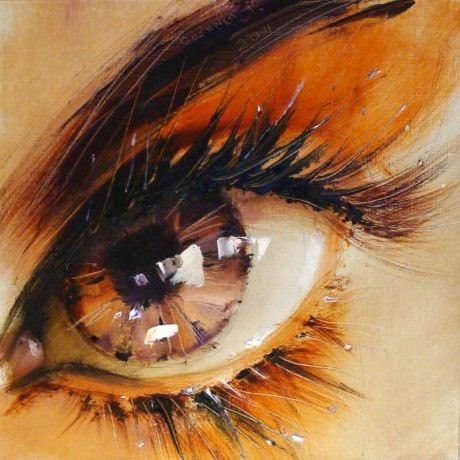 Last night I was browsing through paintings by different artists and I thought I should share some here. 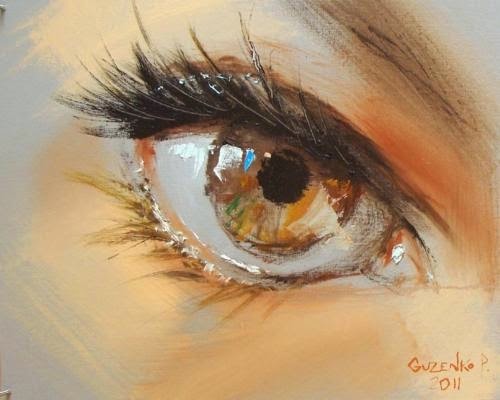 I'll be sharing paintings by different artists in next few blogs. 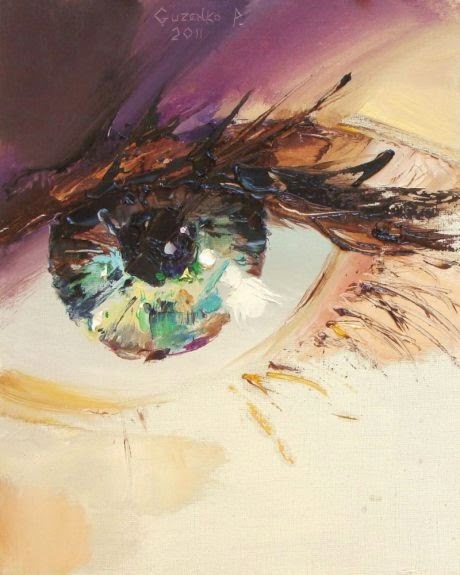 All of these paintings are amazing, but I like the first one the most. 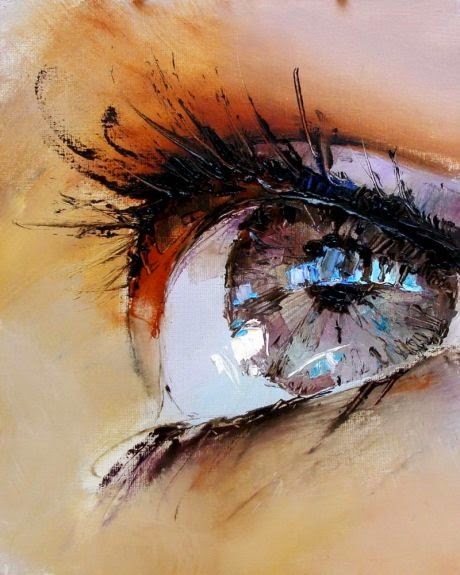 The way the light reflections and the details are addressed is mesmerizing. 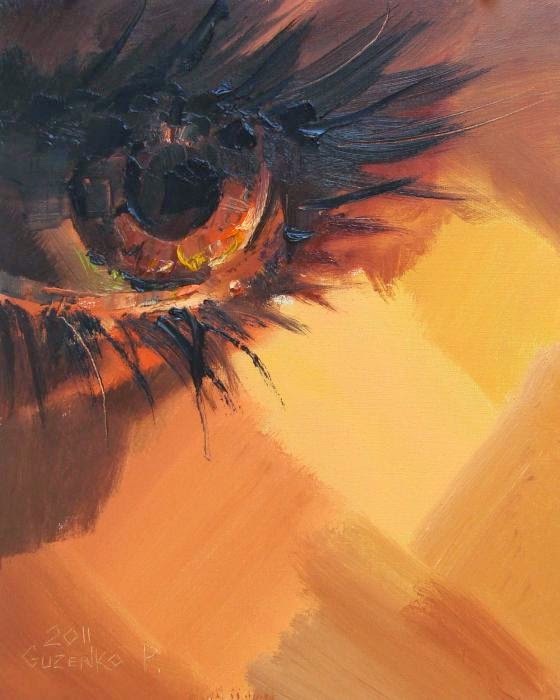 It looks like its eye of a young person who has ambitions for life and is looking at the bright side of the life. Simply Stunning!!! How to run YouTube or any blocked site in Pakistan? How to buy a used car in Pakistan? Copyright - All Paksitan Blog. Powered by Blogger. Lets plant a sapling today.